PuzzleMad: Wil causes pleasure.....and MUCH pain! Wil causes pleasure.....and MUCH pain! I apologise to those of you who expect my posts at the same time every Sunday afternoon! I know that I am a bit late - I had written a lot of the post yesterday but didn't have time to finish it. Unfortunately I have spent most of the day (from 7:30am) in Sheffield's emergency operating theatres and have only just got home to finish it off. I guess that since my work finances this expensive habit of mine, I really shouldn't complain too much! It has been a very long time since we had any sort of update from Wil Strijbos. There have been intermittent reports of "it's coming" or nearly there but we have this problem to be sorted. Then suddenly out of the blue we got a couple of newsletters each mentioning just 1 new puzzle. Beautiful and heavy metal inside! A pleasure to look at! 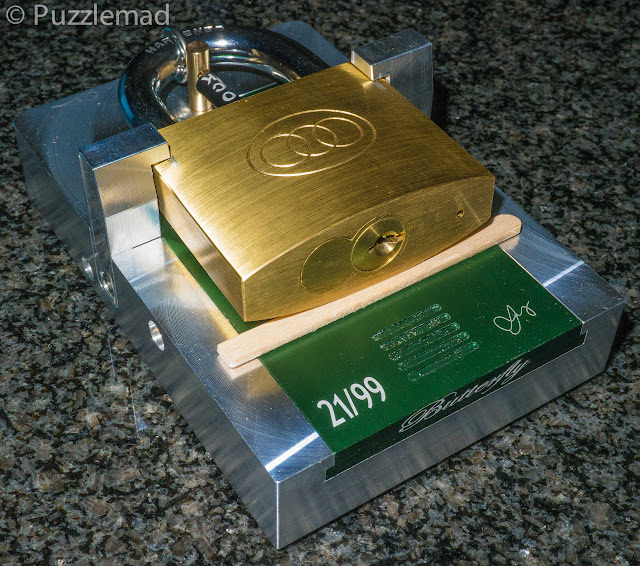 The first newsletter described the Butterfly lock box which was quickly also named by Wil as the Pleasure and pain puzzle. I have to say that the initial pleasure of seeing an update from Wil and a delighted read through the instructions and the history was followed by an "OMG!" of pain. In fact the OMG! was loud enough to make the present Mrs S look up from the Mulberry handbag website to look at what was wrong! Believe me, almost nothing can tear Mrs S away from handbags unless it is shoes..... or diamonds!! Whack!! Ouch! Sorry dear! This puzzle is eye watering in price. It is a staggering €380 and I know that you are all immediately wondering whether it is worth it? Well bear with me a little while and I will try and come to a conclusion. The first thing to be aware of is that Wil first had the idea for it in September 2013 and sketched the idea down. It has taken nearly 2 years to bring it to fruition, multiple trips to China where it is fabricated and several iterations to get it working fully. I am sure that the development cost for this will have been huge. 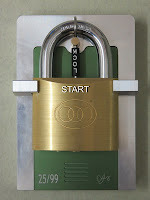 The other thing to consider is that it is milled from a block of Aluminium, some of which is anodised and engraved, there's also some steel components and also a particularly large and handsome padlock. This monstrous thing weighs in at a mighty 1.5Kg and is huge at 133 x 90 x 47mm. 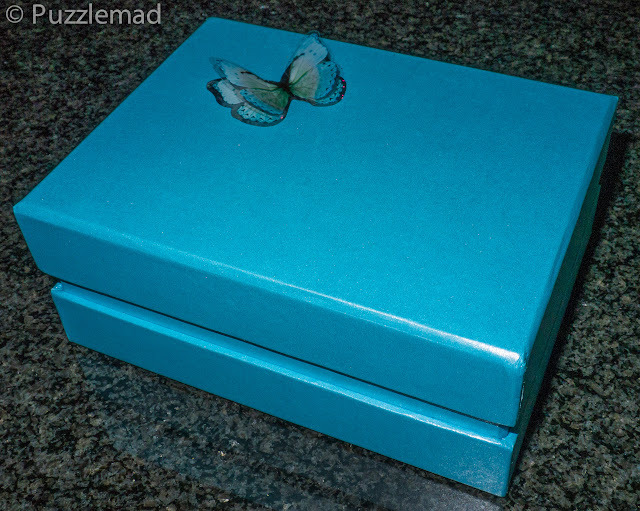 It should be borne in mind that this is a limited production run of 100 pieces which will be numbered: 00/99 - 99/99 (mine is number 21/99 which matches with the number of my Angel box). Just turn things over, slide things back and forth carefully, change positions etc. "Don't bother asking me for hints or solutions." 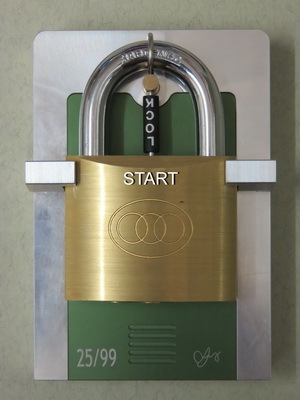 The aim is to move from the start position with the little plastic LOCK tube upside down on the pin to the same position as everything again but with the LOCK tube the correct way up. "...and remember there is No Hurry, please take your time, and be sure you don't forget anything at the end... or pain awaits"
I would say that this statement is VERY important! Don't go rushing in headlong! Understand the puzzle as you go or it will end in pain! As far as I know Shane was pretty much the first to receive this puzzle and he sent me a delighted email and set to work. I got a running commentary from him and a howl of delight when he fathomed it out. He was pretty skilled - he only experienced a small amount of the pain! You should be aware that if you follow the rules and work on the puzzle there are varying degrees of pain that can be experienced. Let me tell you that I am aware of some puzzlers who managed the entire puzzle with no pain at all and others like me who experienced the full gamut of pain! Of course during the experience it is possible to feel quite a lot of pleasure too. During my solve I definitely started out with pleasure! but it didn't last very long. The most important thing to realise is that when you have experienced your pain and informed Wil about it then that causes him to experience much pleasure! Wil experiences the pleasure of receiving your cash, the pleasure of your enjoying his puzzle but even more the pleasure of your pain! What are my thoughts about this? I was shocked at the price but as I said last week it is not expensive it is just rather a lot of money. The sequence of moves required initially appears pretty easy but believe me, it is not! To get it right and not experience pain requires a serious understanding of the complexity of the mechanism. You could argue that the more pain that you experience, the better value for money! But maybe that is just me trying to justify my masochism? I have now fully understood the puzzle and can achieve the required positions in about a minute - I love it and have solved it repeatedly since getting it. 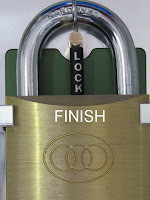 The repeatability is not in the solve it is in the pleasure of the very clever mechanism. Should you buy one? That is hard to say - if you can afford it without getting into financial trouble then it is a great addition to your collection and will maintain it's value over time but it is not for beginners to this mad addiction of ours! 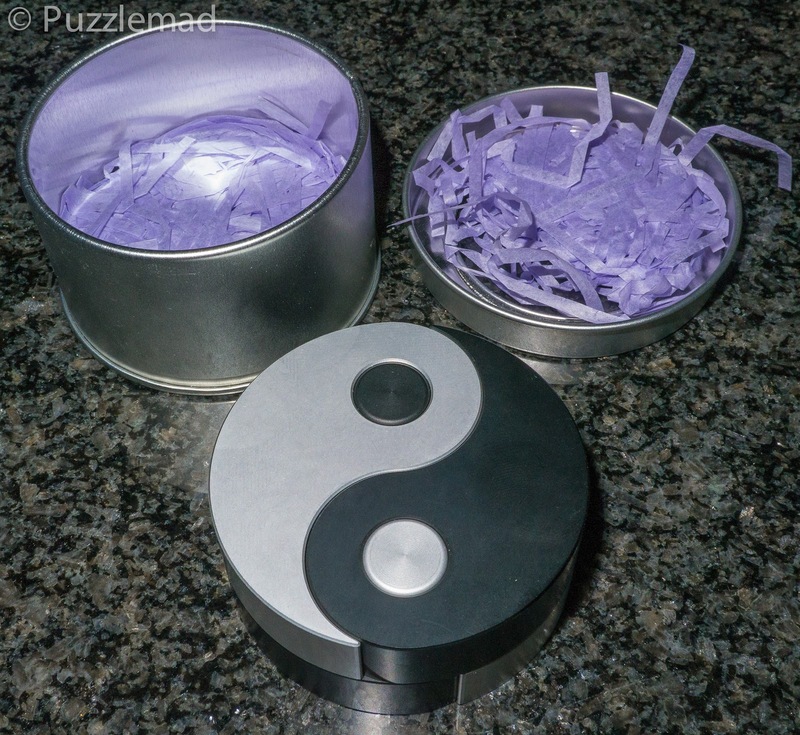 The other puzzle which was in Wil's second newsletter was the Ying Yang 69 puzzle. As soon as I saw the picture in the email I recalled how I had played with the prototype at the MPP last year just before the IPP. It had been designed by Ayi Liu and my friend Otis Cheng (a fellow admin of the Puzzle Photography Facebook group) had brought Ayi's prototype over for people to play with. I had tried to solve it for about 30-45 minutes and had singularly failed. I thought nothing more of it until it appeared in Wil's newsletter. It transpired that Wil had seen it and decided that it was worth developing. He took it from the prototype phase and arranged for it to be mass produced. The final version is absolutely stunning - it is 60mm in diameter, 26mm in height and weighs 200g. 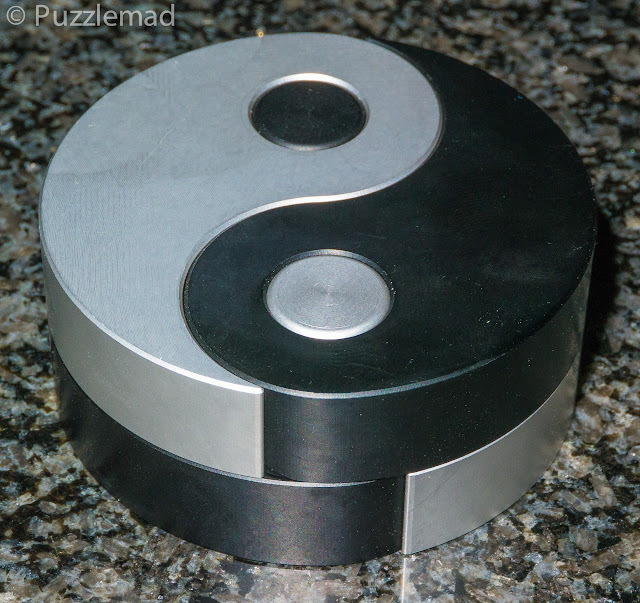 The puzzle is made from aluminium (some pieces of which are anodised) and has steel components too. The aim is to disassemble it into (at least) the 4 component sections and then of course to reassemble it. It also is not a cheap puzzle at €110 but is absolutely beautifully made. The first thing I did was take it to work - I was doing a vascular surgery and interventional radiology operating list the following Monday and I have often managed to sweet-talk the radiographers into taking a quick pic of my new metal goodies. I convinced the superintendent radiographer that she wanted to see the inside of my new toy and duly got a plane film in both axes. I was very careful not to actually look at the images as I didn't want to get any hints for solving the puzzle. I then put it away for a day to ensure that I definitely didn't remember anything. The following day I took it out and began to explore - I did remember a bit of my findings from the MPP and so managed the first move fairly quickly. After that I was quite stuck for a while. Nothing else seemed to work until by pure accident something changed. At this point I jumped and reset it by accident. Stupid boy!!! Back to square one and I only managed to repeat my feat after another 20 minutes! It took a few new moves and I managed to separate the puzzle into 4 segments. It actually comes apart even further than that but I don't want to give too much away by showing you all of the pieces. I absolutely love this puzzle - it is a great worry bead and is a very slick idea. My Xray would not really give too much away but it's definitely better to solve it before seeing the Xray. All in all, I have spent a fortune recently and am delighted with Wil's latest offerings - I am sure you will be too if you can afford the high starting price! Thanks Wil - I am already looking forward to the next newsletter but do hope for the sake of my bank balance that you do actually wait a while. Beautiful puzzles and lovely reviews. Thanks for your detailed descriptions and photos! I have the pleasure of reading about this puzzle and the pain of no replies from Wil!!! Why do you highlights words?? It's painful for the eyes lol. !!! Funzzle Puzzles - Beta followed by some PAIN! Not Terribly Bright - My Hall of Shame!